Meghan Markle and Prince Harry are all smiles Down Under on the heels of their pregnancy announcement … but royal watchers might say something’s missing. The Duke and Duchess of Sussex hit up Australia Monday on the first day of their royal tour there … no doubt still sporting wide grins after Kensington Palace announced earlier in the day they’re expecting baby no. 1. The former “Suits” star is due sometime next spring … around their one-year anniversary. We know what everyone wants to see, but it just ain’t there yet — the royal baby bump. Harry and Meghan — who will be Down Under for the next 16 days — started their tour at Admiralty House and a meeting with Governor-General Peter Cosgrove. 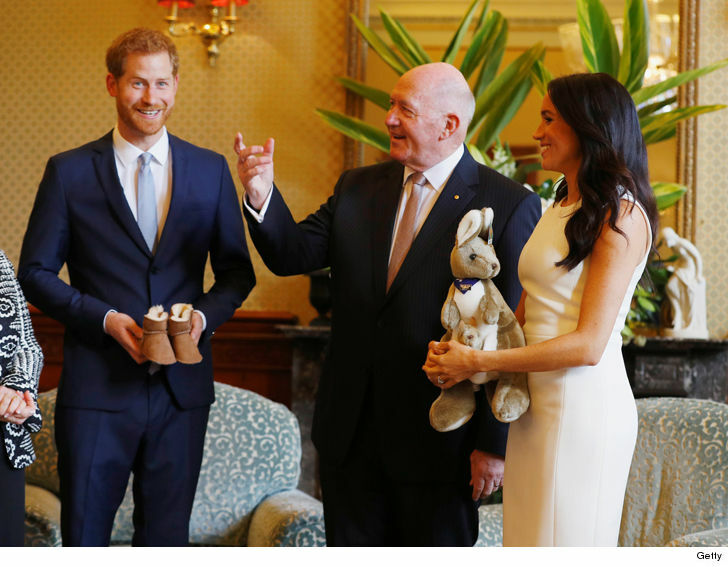 He’s no fool, Cosgrove had some Aussie themed baby gifts … a pair of baby Ugg boots and a stuffed kangaroo. As we reported … Victoria is the odds-on favorite name, at 8/1, if it’s a girl. Leading boy names are Albert/Arthur/Philip … all at 10/1. Remember to bet responsibly.